April 15, 2013: Richard Davis made a few records. The Crust Brothers Bessie Smith Marquee Mark Telemomo 1998 Happy bday, Bessie. Hey ya Jeffs. Just hanging around, waitin' for something to happen. howdy folks! will be crazy with work but will be listening eagerly! Helloooo! Carmichael, ljfw -- hope we can make it happen. I have to request your indulgence on the freeform front this afternoon. Toward the end of the the show...we've...taken some liberties. SINKING OF THE TITANIC - DID SOMETHING BIG DISAPPEAR? Heya, duke, Doug. And all the ships at sea. take 'em! the more liberties the merrier. liberties for all! Hey this is Gavin Byro who were made all those boring songs for airports records in the 70s isn't it? It's tax day in the US, but it's DO radio day everywhere. @Sid: you off your meds again? @duke: bank holidays for all! ran out last night so its gonna be a weird night from here to eternity! As opposed to all those exciting, thrilling songs for airports. can't say i've heard much music in the modern airport. I think it was in the 60s and 70s that airports played various types of muzak to create the right ambiance. Eno's album of course is his own emotional response to being in an airport, nothing to do with browsing duty free! Can't say why, exactly, but this thread makes me wanna go watch Jacques Tati's "Play Time." Again. Oh PLAY TIME! Saw it recently on the huge screen at Lincoln Center, with Jeff J. What a wonderful experience. my VLC player is stuttering as I think it keeps losing the stream - anybody else having problems with it? has it got something to do with that cyber attack that affected cyber attack a week or so ago? I once had a hot architect girlfriend. She would put on Play Time and do a (virtually) frame-by-frame play-by-play for the whole film. Needless to say, I have pleasant associations with the film. I can see why architects would dig that film. I loved Ed Blackwell more than that ex-girlfriend. Hello, beautiful brainchild of Sid & Marty Croft. Talking during Playtime? Man, not for me, thanks. Fun fact: both Doug S and I were stunt doubles for Johnny Whitaker in the 1970s. I stood in for the Magic Flute. Actually, I was a stunt triple. I have to have the sound off for a while because I left my earbuds at home and it's awful. You sayin' Jaki Byard is awful? I wonder if Gavin Bryars and Jaki Byard were related. Having trouble hearing what you are playing. Oooops that's cause I am listening to Irene. I can't hear a note. The not hearing is awful. Hi, Alf from Upstate! Good question. I've wondered the same re Jaki B and Jaki Liebezeit. I think it's fair to say the Sam Rivers was not well served by Impulse in the '70s. Uncle Michael imagine what the tunes sound like and keep bopping your head around to the beat. It will keep people wondering. Ooh, missed some Dolphy and Rahsaan. Evening all. this John Carter tune is VERY SOFT. Please adjust your sets accordingly. Welcome aboard, Shaun. Grab a life vest. @JeffG It's about this time on a Monday that I normally tweet about D:O not tweeting that the show's on and you RT me. Same again? I'm just going to sit here and tweet to the imaginary music for another 33 minutes. Ugh, yeah, Shaun. Let's do it. Hey, holland oats! Thanks! Yeah! 'course, all thanks to RICHARD DAVIS, for making a helluva lot of good records. 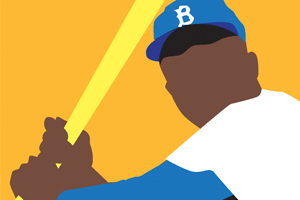 Jackie Robinson Day memories: I met Jackie when I was eleven, though admittedly, I didn't realize it right away. I was staying at the Grand Hotel Anaheim on a trip to Disneyland with my dad and rode the elevator to the lobby with Jackie. He was nice and chatted with me. When we exited the elevator he was swarmed for autographs (there was an oldtimers event going on at the hotel) and I got close and got an autograph too...just to find out who the hell this guy was. The Tigers were also staying at the hotel and I got Denny McLaine's autograph too...but Wini Haun got mad at me and tore it up. Thanks for the Bingo Miki link. Not sure how I missed that one. What position did Wini Haun play? Bingo Miki should get together with Mongo Jerry and make beautiful babies. @Doug: First girl in my building to develop. @UM: was she anything like Winnie Cooper on the Wonder Years? @Jeff: She spelled her name the same. Hair was about the same color. @Alf: Yep. That's our Wini. I thought it was so weird that at nine years old she was attending like ten dance classes a week. It took. Had a little hiccup trying to sign in. Greetings, ngh, and sdf to you too! @UM: welcome to the audible portion of today's program! Just a heads-up: Frank Sinatra and Roscoe Mitchell lie ahead. I'll just treat them like speed bumps. Meanwhile, I'd just like to add that the Sinatra goes out to my long-suffering wife. Suffering on account of all that jazz, that is. LOVE these D:O Mondays. Bigup the Jevvs and Doug. We're all getting bonus here. Hey, I didn't do nothin'. Just sitting back with everyone else and soaking in every blessed second. My wife yells at me, too. About the dearth of rock & roll in the house. As if that's my fault. missed part of the show, so I'm glad for the extension. Laters, all! Thanks so much for tuning in!